Johnski's and mine arrived at the "Southern Ocean Park" yesterday, but thinking it was due today, we've only just got them. Unpacking them was a bit of a revelation. 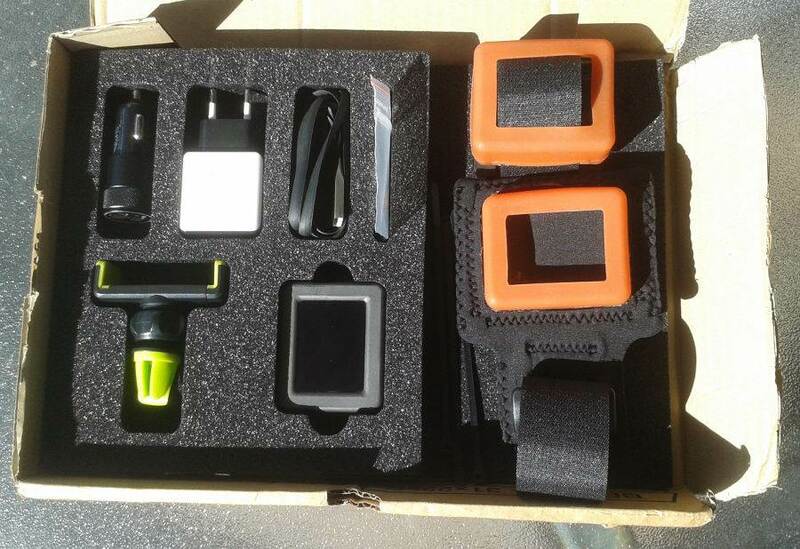 Very well packed, 2 chargers, car and bike mounts, and armband. Then we started to play with the buttons, next surprise was it has Australian maps loaded. And here's a comparison with the GW52 unit and display size. There's not much difference in plan view, the Motion is about 2mm shorter, but the Motion is thinner. The difference in display size is substantial. As soon as I sail with it, there'll be more stuff. I've set mine to 5hz and I'll wear it in my helmet along with DIY V3 also at 5hz. I'm expecting very close results. When I get to a windows computer with Ucentre I'll set them both to 10hz. At the moment can only connect with windows, neither mac, ubuntu or mint will do so. The latest GPSResults will process, .oao files. Had a look at one today. If it pass the tech stuff it looks like it will meet everyone's needs. Received mine yesterday as well and looks like a great little GPS! Very easy to navigate, download files and update software (already a new version available)! Will trial alongside my GW52. When I made the first few of the new revisions, Laurent noticed an issue on his Mac. I spent a week on it but couldn't find a software fix. It was hardware related. So I decided to send these few devices to users who confirmed they only use Windows. Prior and later devices should be fine on Windows/Linux/MacOS. These few are Windows only. And if I sent one to someone not using Windows, drop me a mail. I thought only Andrew asked for a MacOS version. The devices sent this week and further are all Windows/Linux/MacOS-capable. We have had samples for a couple of days now, but not really any chance for proper on water testing yet. We have done some car testing and walking around. We have found a few small but important things so far that will need to be changed, but otherwise it is looking very good. Julien is very responsive and helpful so I don't expect that it will take long, but who knows? I used my Motion for the first time yesterday. It is robust and simple to use and provided great feedback while sailing. 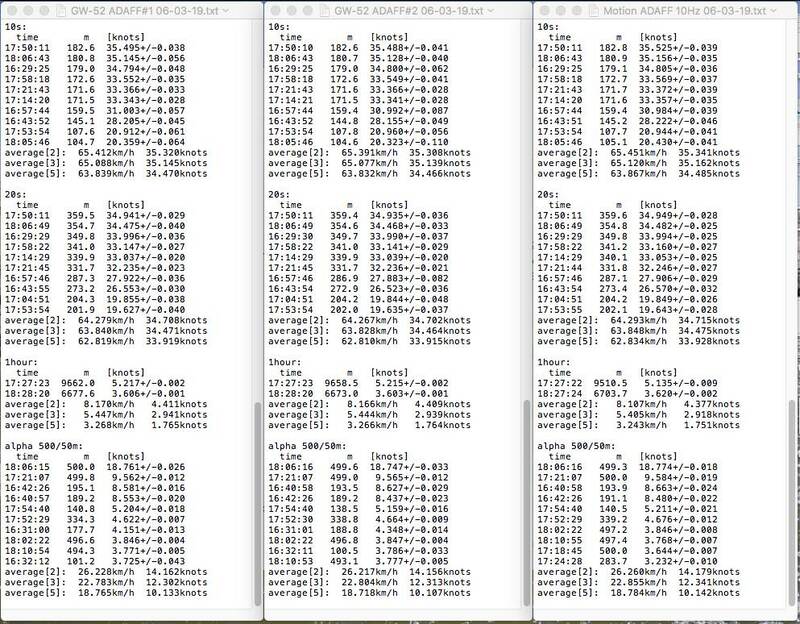 Downloading and analysing log data is very straightforward on GPSResults. KA72 can't read the files, hopefully Dylan is working on this? It would be good to have the testing completed by Burrum Windfest. >>>It would be good to have the testing completed by Burrum Windfest. We're about to test the latest experimental firmware, that also includes alpha 500. That's great. Another improvement would be the option to automatically cycle through performance screens. I sailed for 4+ hours at 5hz yesterday and used 12% of battery capacity. This translates to 30+ hours use out of one charge. 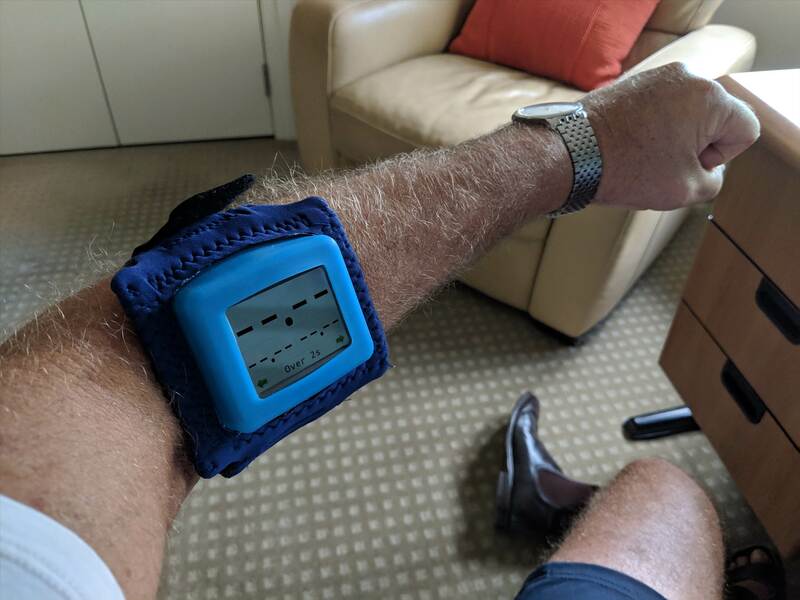 The arm band works really well. I wore it on upper forearm which allowed me to easily read the screen as I sailed. Wearing it in this location restricts arm flexure a bit handling the board and sail while stationary, but it's not a issue when sailing, as I sail with a straight arm. The arm band felt secure and survived a couple of low speed tumbles. I'm thinking a tether to my impact vest might be a good investment in +25kt conditions. Operation of the buttons through the arm bands flexible rubber collar is easy. A photo of the Motion in thr upper forearm position. I can easily read the screen while sailing. The screen shown is the 2sec performance screen. The top number is the current 2 sec speed. The bottom left is the last run. The bottom right is your best run. You can toggle through multiple performance screen while on the run. 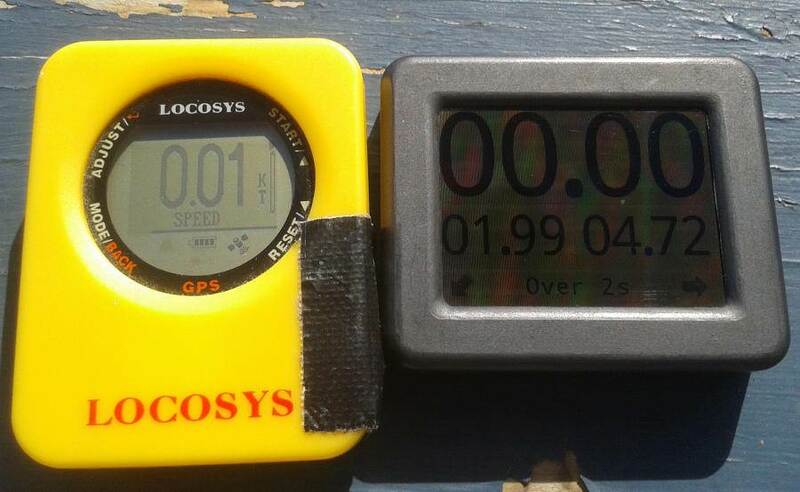 These include 1 sec, 10 sec, 500m, Nm, Hour. There is also an option to customise the screens. Your photo suggests it is the flange in the neoprene arm band which is the main cause of this. Hard to see future versions not being able to reduce its size and impact. (ie make it smaller until it no longer does its job, then go back to the last one that did) or just redesign. Not sure flang need on elbow side. The experimental firmware is a big improvement. In the car test today, it very closely agreed with our other devices. My alpha simulations produced a top of 34.something, so not that realistic, but there were several at much more relevant speeds, 17 to mid twenties. 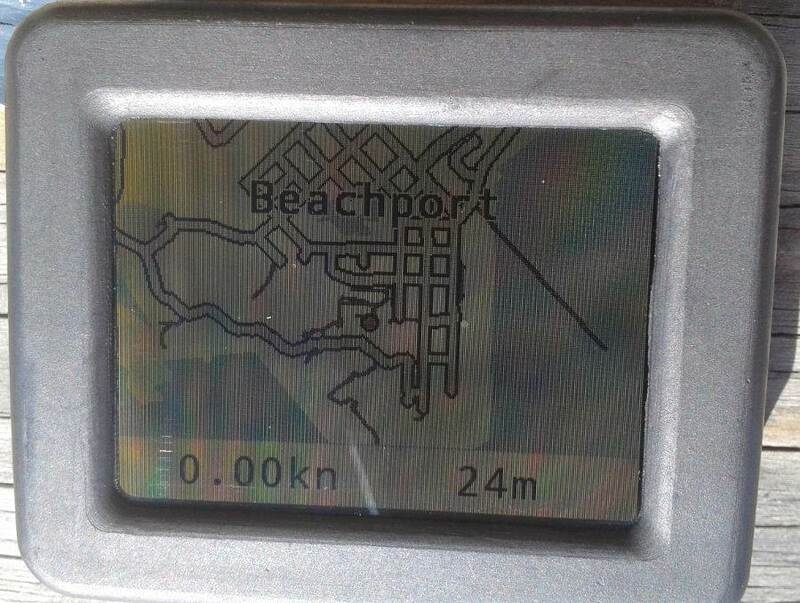 The display readout was a tad high by 0.2kts to 0.5knots, I'm sure a bit of collaboration between Peter and Julien can soon fix this some. With any luck we'll take them sailing tomorrow, and get some real life data. Working with Daffy, Peter and Julien on this has been a great experience!!! The speed of julien's responses is phenomenal, five fixes in an "very experimental" update that only took one day. And the alpha 500 is so close for a first attempt. > That's great. Another improvement would be the option to automatically cycle through performance screens. Hello ! There's a "carousel" coming where you can decide of a few pages to cycle through and when they should switch (every 10s, every 30s, after a run, after a new best). Awesome Julien.It is a great unit. Unfortunately I'm off testing for some weeks. I had an infected cyst lanced to day, and we are now on the way back to WA. I'll probably have surgery to remove the rest of the cyst once the new antibiotics do some good. So if anybody is sailing with a motion and another 5 or 10hz device, I'm sure daffy would appreciate the files. It's best if they are both running at the same frequency, so if you're comparing to a GW52/60 set the motion to 5hz, also make sure the motion has the latest firmware, some of the earlier versions aren't what we want. Sorry to hear that! Yes, will set the Motion to 5HZ and get some files for Daffy to compare with the GW52 next time I go sailing! Update on the testing and approval process. 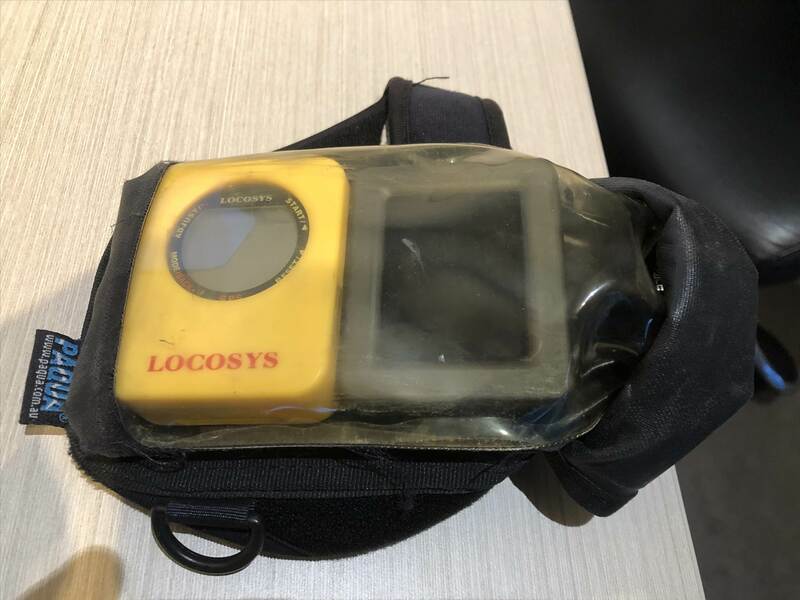 There is now no doubt that we should be able to recommend approval of this GPS to the GPS-TC advisory Panel for use in the the GPS-TC. The only things we are yet to finalise are a couple of parameters which must be locked into the firmware to meet our rules. That should be finalised within days. There are still many changes being made and updated to the user interface, but they do not affect the basic technical parameters which we need to approve it. But each change is bringing a new FW version, so we just have to sort that out with the manufacturer and we are good. We have analysed quite a lot of files now, more driving than sailing unfortunately, but that has informed us a great deal anyway. Just as an example, for your edification, here is a comparison from todays session compared with two GW-52's and analysed in GPS-Results. Mounting: GW-52's both in my helmet. Motion in the supplied arm band on my right Bicep. TheGW-52's are of course 5Hz. The Motion in this test was set to 10Hz.The eagle eyed among you will notice that some of the shorter duration results are very slightly higher in the Motion results. This is a normal results of using a higher Hz device that can find a slightly better slice of the speed curve on a typical speed run, or distance closer to the minimum distance for say, a 100m. It is just a more optimised maximum sample. We see this difference between the 1Hz GT-31's and the 5Hz GW's as well. Any idea what's going on with the 5th 500 m run? The Motion does not overlap the 2nd GW, and just barely overlaps the 1st. I'm just curious if you noticed something in the data. Probably just the 10Hz difference using 1.1m shorter distance. With the fine tuning being done will current units be able to be updated with the relevant updates bug fixes firm ware adjustments? Future proof? We should buy one now or wait a little longer. Dave, firmware updates are dead simple, this unit is very user friendly. John and Julien have made a great "GTC custom" menu with 4 windows. 2sec, shows current speed in big font, with session best and last run together underneath. 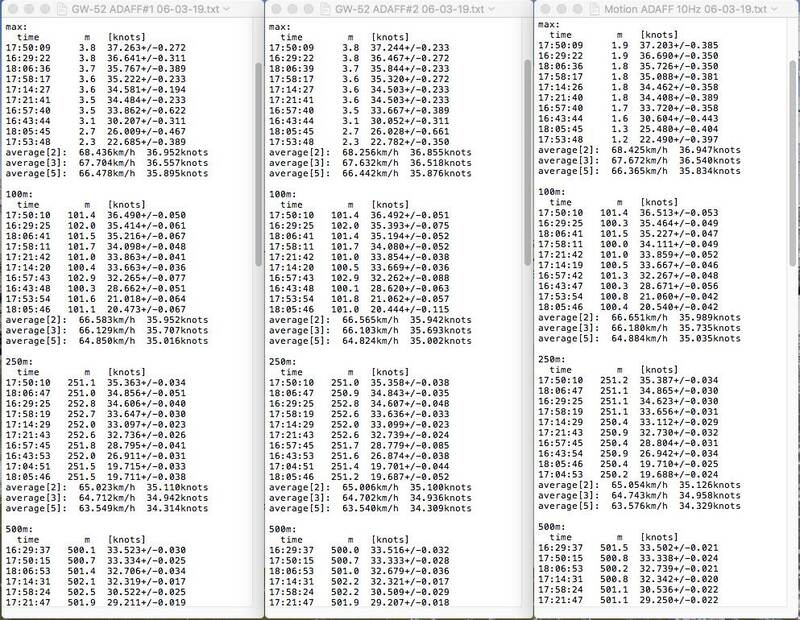 5x10, shows current average of 5 best 10s runs in big font with best 10s and last 10s underneath. NM/Alpha, shows best alpha and last alpha in medium font at the top, and best NM and last NM underneath. Hour, shows average speed in big font at the top, with current time and distance underneath. The Motion can convert the .oao file to .ubx format before downloading/copying to your computer. Currently, both GPSAR-Pro and GPS-Results can read and process this file format and give you your results. The later Windows versions of GPS-Results can read .ubx files and convert them to .sbp format, which can then be read and processed correctly by all the approved analysis programs including KA72 speedreader. The Mac versions of GPS-Results can only read and process .ubx, it can not save them as .sbp. The free trial versions of Windows GPS-Results from V6.148 until V6.161 can convert .ubx file into .sbp files for upload to KA72 speedreader. As mentioned, the Mac version can not do this. KA72 speedreader can not currently read either the .ubx or .oao files directly. Quick word about .OAO : it's useful and required. It isn't my will to have yet another format. It's half the size of other formats for the same data and accuracy. It's faster to parse, to seek, to skip. If it wasn't for it, we'd waste battery life. And we couldn't display logs, tracks and emergencies on the map. Nor display previous logs without recomputing everything every time. Nor have anti-tampering for competitions (some news coming). Some parsers and organisations included it quickly, some are in the process of including it and some I've and users have never heard back from sadly. We'll see. Developers and organisations can send me their current parser for another format and I'll send back the equivalent for oao. I'll add the choice of automatic exports in the next firmware and maybe some more export formats. I used the Customs screens in my session yesterday. They provide the best "on the run" feedback, I've ever got from a GPS unit. I had a quick look at one at Lake George. It was on someones arm and they were scrolling through things and finding buttons. For someone who isn't very tech savvy you couldn't see any buttons once it's in the armband. How do you know which buttons to push and where they are? The neoprene covers them so you have to do it by feel and guessing? Not much good for someone like me.. I'm marking the armband with a texta., to show where the buttons are. Once you remember what the buttons do it's fairly easy. It's quite logical, and intuitive, doesn't take long to pick up the system.